A few marshes in north-central Mexico are so chemically unique that some scientists think they're "little versions of the primordial sea, before the dawn of nucleated cells." "Fed by underground waters coursing through the mountains' limestone layers and caves, as well as gushing up from deep and ancient aquifers, the pools – or pozas as the locals call them – have strange chemistries. Phosphorus tends to be in short supply, whereas calcium, magnesium and sulphur are richly available... Primitive microbes flourish here." Some of these marshes are choked with "microbial mats. Under certain conditions, some microbes, such as photosynthetic cyanobacteria, sulphur-reducing bacteria, nitrogen-fixing bacteria and other helpful waste-eaters, glue themselves together into slimy cooperatives that are often layered like a cake. The incorporation of silt and minerals creates a harder structure, a 'living rock' called a stromatolite." 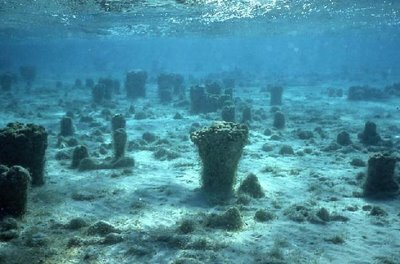 [Image: An underwater field of stromatolites, from MIT's geobiology lab]. These ecosystems are so chemically abrasive and oddly unlifelike that scientists from Caltech's Virtual Planetary Laboratory hope they might even reveal what forms organisms could take on other planets. (For a bit more on this see Lunar urbanism 3 or Super Reef; and for some very vaguely – in fact really not – related photographs, see this interview with David Maisel). I have been to those places on the map. Cuatro Cienegas is particularly strange. The landscape is dry, sand and gypsum dunes (the day we camped there was so windy we had to wear swimming goggles to see), and rivers, ponds and other body waters. Too bad some parts are very polluted or overcrowded with weekenders. The best pond nowadays is closed because due to damages caused by tourists. 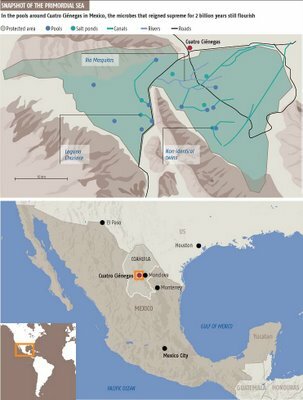 I've just been reading about some interesting Mexican caves. Like these marshes, they are high in sulfuric acid and contain interesting microbes and microbial aggregations, leading investigators to discuss them in terms of life on other planets. I don't know how to post a web address, but search Lechuguilla Cave and Cueva de Villa Luz. I believe Science or Discovery mag had an article on them recently. Hey Jim - Funny timing: I posted about the Cueva de Villa Luz just a few days ago. But thanks for the tip!